Just as Mathias Enard’s Zone was eligible for this year’s Independent Foreign Fiction Prize despite having been published in the US in 2010, so Valeria Luiselli’s Faces in the Crowd has made it onto the Best Translated Book Award shortlist on the strength of its US publication date though its first appearance in English was in 2012 thanks to Granta and translator Christian MacSweeney. It may be a short novel, but it tells a number of stories which come to inhabit each other in the process of the telling. She tells White that she has discovered translations of Owen’s poems by Zvorsky: “It was the most unlikely of all possible lies about Owen, and White never believed it, but he decided to go along with me.” Owen becomes an ever more prominent character in the novel, firstly through the author’s post-it notes of her research, and then when he becomes a further voice in the first person narrative. We know, however, that parts of the life Luiselli gives Owen are fictional – including his friendships with not only Zvorsky but Federico Garcia Lorca (based entirely on their proximity at the time). As the novel nears its end the author becomes more and more isolated, as if she were less and less present in the world as Owen’s character grows stronger. The novel’s conclusion seems created by the novel’s conclusion. 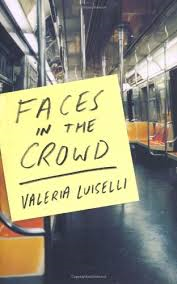 Faces in the Crowd manages to be both serious and playful (surely the decision to feature an obscure poet is a nod towards Bolano, who is also name-checked in the novel). It announces the presence of a fascinating new writer. Luckily, those of us in the UK don’t have to wait to see what she will do next: her second novel, The Story of my Teeth, has just been published. You are currently browsing the archives for the Valeria Luiselli category.